You know you need new tires, but you’re not sure what type. You look at a tire to get the size: 225, 50, R, 16, 92, H. All the way to the Mission Viejo service center you keep repeating it over and over. You even say it over in your mind while waiting in line. Then you get to the counter and the manager asks what size you need. Then your mind goes blank. Tire size can be confusing for many Mission Viejo car owners. There’s so much on the side of the tire, and it’s hard to keep straight. Even though there’s a lot on a tire – if you know what it all means, it’s actually more helpful than confusing for Mission Viejo tire shoppers. Let’s start with the size number. The 92 is the load rating index – it’s the load carrying capacity of a tire. The higher the number, the more it can safely carry. Your empty pickup can be safe with a lower number, but you’ll need a higher rating if you routinely haul heavy loads around Mission Viejo. The next letter is the speed rating. Not all tires sold in Mission Viejo are speed rated. The ratings generally follow the alphabet: the further up the alphabet, the higher the speed rating – with the exception of H – it comes between U and V (don’t ask why). There’s a lot of fine print that most Irvine auto owners probably need a magnifying glass to read. But there are a couple of other large print items of interest. One is the tread type: highway, mud and snow, all season, severe snow, etc. And then there’re the Uniform Tire Quality Grading System markings. The first is a tread wear index. 100 is the base line – a lower number is poorer and a higher number is better. All things being equal, a tire rated 200 would wear twice as long, on a government test track, than one rated at 100. These wear grades are only valid within the car maker’s product line – Mission Viejo drivers can’t compare with other car makers. And it’s important to note that a lower rating might be just what you want – a high performance, sticky tire has a softer rubber compound and won’t wear as long, but boy, will it take those corners on twisting CA roads. It’s safe for Mission Viejo auto owners to go with the car maker’s original equipment recommendations that came on your car. But if you want to make adjustments, you’ll now be better equipped to communicate with your understanding Autobahn West tire professional. A lot of people get custom wheels in Mission Viejo. When you do this yourself (over the internet . . .) you could run into trouble if you’re not careful. Sometimes, once they’re mounted, they just don’t fit right. The tires rub in turns or on bumps. You don’t want that. Consulting your Autobahn West tire professional can ensure you get the right fit. First he’ll ask you a series of questions about your Mission Viejo driving needs and what you want in your new wheels. Now, not every wheel can go on every car. Care must be taken so that tires and wheels are not too large or that the wheel is centered too far towards the outside or the inside so the tires rub. If you don’t want to make any modifications to your pickup, you would need to focus on the wheels that would fit. With trucks, some Mission Viejo people like much bigger tires so they need a suspension lift. Also, most Mission Viejo drivers don’t realize that you need to keep the rolling diameter of your new tires – that’s, like the overall height of the tire – very close to what came from the factory in order for your pickup anti-lock brakes and stability control systems to work properly. The computers that control these systems are calibrated to a certain size tire. When you go bigger or smaller, the computer doesn’t know what changes you made so it can’t tell how fast you’re going. This, of course, means it sends commands to the brakes and traction control that are based on the wrong speed. If you go with a different rolling diameter, your pickup engine control computer can be reprogrammed for the new tire size. Either way, there are hundreds of wheel and tire choices to choose from in CA. You can pick the style of wheel you want and then talk with your understanding Autobahn West tire professional about how big the wheel should be – and how to select the right tire for your pickup. Your Autobahn West service advisor will help you find the best tire to meet your style, performance, ride and handling needs in Mission Viejo. Custom wheels are one way that Mission Viejo folks express themselves and personalize their pickup. But they aren’t as cheap and easy as sticking decals on your back window. There are several critical factors need to be considered, including cost, the fit of the wheel, modifications that will have to be made to the pickup, how the new wheels and tires will affect the operation of the vehicle, your driving habits, and, of course, the style of the wheels. Most Mission Viejo car owners start with the last factor: the style of the wheels. But that should be the last thing we choose. When considering custom wheels, you should first carefully consider your budget. Some wheels may require costly adjustments to your pickup suspension system, brakes, or traction systems. You need to know what you can afford before you start shopping in Irvine or get your heart set on a particular type of wheel. There are three basic ways you can change your wheels. First, you choose a wheel that is already the same size as the ones on your pickup. Second, you can choose larger wheels, and third, you can choose smaller wheels. Mounting wheels that are the same size as the ones already on your car sounds easy enough. But, even though the wheel may be the same diameter as your current wheels, but that doesn’t mean it will fit your pickup. Besides diameter, wheels also have an offset. This is the measurement from the inside edge of the wheel to the point at which it bolts on. If your new wheel does not have the same offset as your current wheels, your pickup tires can rub on the inside or outside of the wheel well. This can lead to blowouts, uneven tread wear, and other mechanical problems. The tire and wheel professionals in Mission Viejo at Autobahn West on 25800 Jeronimo Rd. #200 can help you select a wheel that has both the correct diameter and offset for your pickup. Or, if you really want a specific wheel in spite of the offset difference, your may be able to install adapters that will make the wheels fit. Mounting larger wheels is a more involved process. There are several ways of doing this. You can mount larger wheels, but keep the overall tire diameter the same. Or you can “supersize” your tire/wheel combo. Mounting larger wheels while maintaining the same overall tire diameter is the easiest way to increase wheel size. You still need to adjust for offset. Generally, this alteration means that your new tires will be wider than the originals, so you will have to install adapters to keep them from rubbing on the wheel wells. Consult your Autobahn West tech by calling 949.525.9730. If you want to install larger wheels and increase the overall tire diameter, it is key that the package fits in the wheel well: you may have to do some minor modifications to your suspension. More importantly, you will have to reprogram your pickup engine’s computer to calibrate for the larger tire size. The computer calculates your speed based on the rotation of your tires, so increasing the size of the tires will render it inaccurate. Inaccurate speed calculations can mess up your anti-lock brakes and your stability control systems, as well as your speedometer and odometer. As you can see, the more modifications you make, the more essential it becomes to have your understanding Autobahn West service specialist tire and wheel professional help you with your car care. 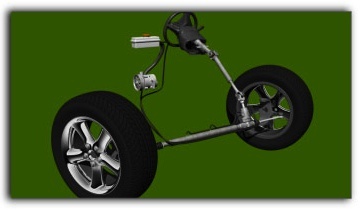 The larger wheels and tires will add weight to your vehicle. This weight is not held up by the suspension system, so is referred to as “unsprung” weight. Adding unsprung weight affects your car differently than just adding loads inside of your car. Unsprung weight can affect acceleration and braking. Putting large wheels on your pickup may require an upgraded brake system. Also, you may not get the performance from your pickup that you’ve been used to. It may be sluggish when accelerating or harder to handle when turning. You may also find that the ride is bumpier than it was before. Of course, done right at Autobahn West, a good wheel job can sometimes improve a vehicle’s ride or performance. It just depends on your vehicle, the type of wheels you choose, and what you are hoping to accomplish. Remember your budget? All of these scenarios require that you shell out some money. Perhaps now you can see why it is good auto advice for El Toro auto owners to make that consideration first, before setting their heart on a specific type of wheel. Another consideration should always be your driving habits. Do you do a lot of off-roading on the outskirts of Irvine? Do you carry heavy loads? Do you tow a trailer on CA expressways? All of these factors must be considered when replacing your tires and wheels. Some wheels just may not be up to the work you need them to do. At the end of the day, Mission Viejo car owners should always put safety ahead of appearance. That’s why you shouldn’t add custom wheels to your vehicle without consulting with your Autobahn West tire and wheel professional. Cutting corners when installing custom wheels by not making necessary adjustments to all of the systems impacted by the change can result in dangerous operating conditions as well as expensive repairs down the road. The understanding auto professionals at Autobahn West want to remind Mission Viejo car owners of the basics of vehicle safety: preventive maintenance, emergency preparedness and professional repairs. Stay safe, and stay on the road. Have you noticed an increase in price when you get a flat fixed in Mission Viejo or your tires rotated? It might be the result of your TPMS, or Tire Pressure Monitoring System. Why the new requirement? Because underinflated tires are the number one cause of tire failure. Tire blowouts cause dangerous and sometimes fatal accidents. Underinflated tires also need longer stopping distance and can skid, both of which also present dangers on CA roads. Many flat tires can also be prevented by proper tire inflation, and though this may seem an economic consideration, Mission Viejo car owners who have changed a flat on the side of the road recognize that this has serious safety concerns as well. Advances in tire technology, specifically the development of radial tires has made it harder for Mission Viejo auto owners to recognize when a tire is underinflated. At a recommended pressure of 35 psi, a tire is seriously underinflated at 26 psi. But the tire doesn’t look low on air until it reaches 20 psi. This raises concerns about vehicle owners being able to tell when their pickups are a safety hazard on the road. Hence, the TPMS. So, like seatbelts, the essential TPMS system is expected to save a lot of lives. The technology has been in use in race cars for years, and now it’s being mandated for all passenger cars, SUV’s, mini-vans and pick-ups. Besides warning Mission Viejo drivers when their tires need air, the system is required to indicate when it is malfunctioning. This increased safety won’t come without increased costs to Mission Viejo car owners. Estimates regarding the cost of maintaining the TPMS on your vehicle run from $27 to $100. Also, there will be an added cost for tire repair. Mission Viejo service centers have had to purchase new scanning equipment to work with TPMS sensors and other essential equipment to repair tires and wheels equipped with TPMS. Autobahn West service professionals have to be trained to use the new equipment. These costs will have to be passed on to Mission Viejo drivers. Further, whenever a tire is changed, the Autobahn West technician will have to deal with the TPMS. Sensors will have to removed, then re-installed and re-activated. Sometimes the act of changing a tire will damage a sensor, and it will need to be replaced. These extra services will come at an added charge to Mission Viejo drivers. So, if you’ve noticed an increase in the cost for car care at your Mission Viejo tire center, it may not be the economy. It could be the cost of the TPMS in newer vehicles. Before you dash off an angry letter to Congress, however, stop and consider what you’re paying for. If predictions are correct, the TPMS will save lives, and that will be a benefit to all of us. Of course, no warning system will save lives in Mission Viejo if motorists don’t pay attention to it. And remember that the warning doesn’t come on until the tire is severely under inflated – you still should check your tire pressure at least once a month. Mission Viejo auto owners can prevent accidents and potentially save lives without a warning system by keeping their tires properly inflated.